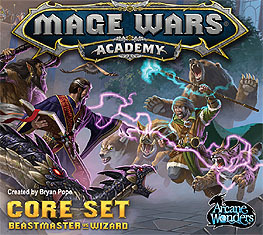 Mage Wars Academy is a fast-paced strategy card game of magical combat. In this core set, play as a powerful Beastmaster or Wizard, competing to prove your school of magic is supreme. Game play is quick and exciting, with tough tactical decisions and devious surprises every round. Players can customise their spellbook, with dozens of exciting spells to choose form. Summon powerful monsters, hurl lightning bolts, and cast secret enchantments. Aspiring young mages from all the nations of Etheria flock to Sistarra, the Grand Academy of Magic. Students are trained in the ancient secrets of magic, and choose which path they will follow. Those who hope to graduate must hone their knowledge and skills, and compete in combat to prove their worth. Follow your destiny, grab a spell book, and Enter the Academy. Mage Wars Academy is a brand new stand-alone game set in the Mage Wars Universe, and includes everything you need to play. All of the spells are fully compatible with Mage Wars Arena.